Screen on the Green on the National Mall may be a thing of the past, but there are plenty of other places around the DMV that host free film screenings under the stars. Nearly every night of the week you can grab a blanket and enjoy a wide array of movies, from kid favorites such as Moana to more serious selections such as Fences, and even recent releases like La La Land and Hidden Figures. Remember to bring your picnics, blankets and bug spray. The Adams Morgan Movie Night has moved to the Walter Pierce Park on Tuesday nights this year. 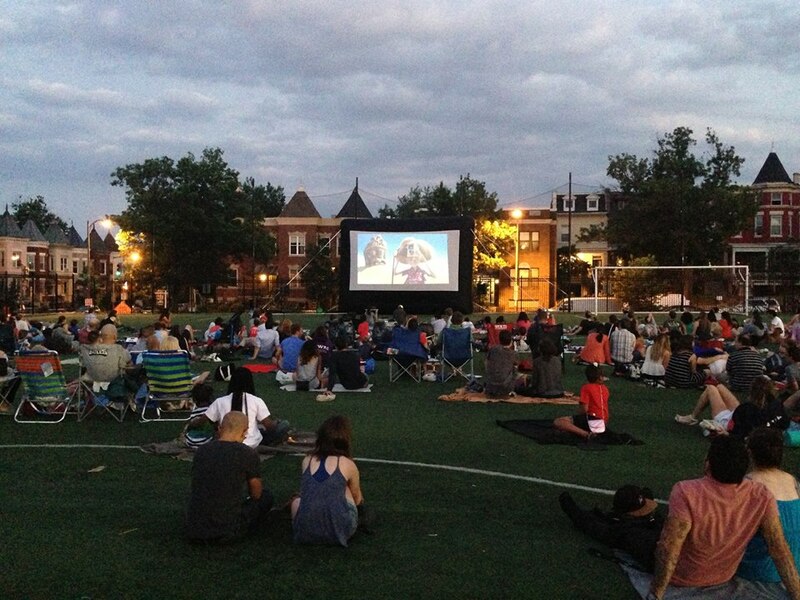 Grab a blanket and some popcorn and head to Adams Morgan Movie Night Tuesdays at sundown (about 8:30 p.m.). 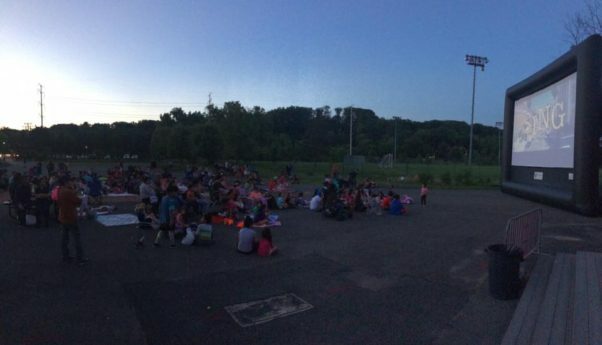 Due to construction at the Marie Reed Elementary School, this year’s movies are being shown at the soccer field at Walter Pierce Park, 2630 Adams Mill Road behind Mama Ayesha’s restaurant. The series kicked off in May and remaining films include Jaws on June 13, Grease on June 20 and Snowden on June 27. 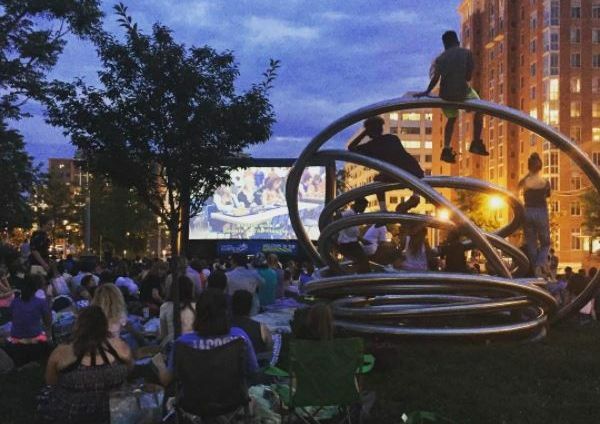 Alexandria is hosting an outdoor summer film festival the first Saturday of every month from July to October. 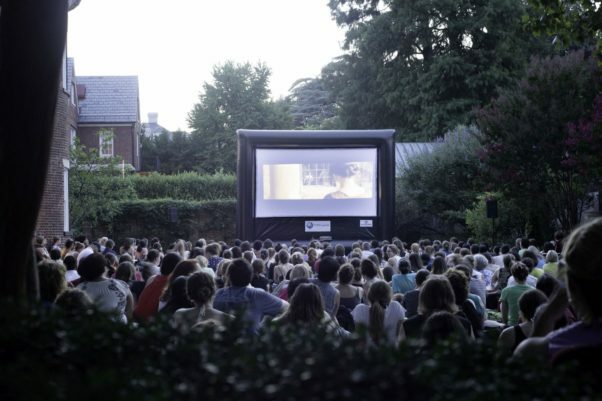 The Saturday Cinema at Carlyle series will run at John Carlyle Square Park, 300 John Carlyle St., Alexandria. In addition, Alexandria’s Nice Cream will be on site selling handcrafted ice cream and Popped! Republic will be selling its gourmet popcorn. The schedule inclues Top Gun on at 8:37 p.m. on July 1, Caddyshack at 8:14 p.m. on Aug. 5, When Harry Met Sally at 7:36 p.m. on Sept. 2 and The Birds at 6:41 p.m. on Oct. 7. Don’t forget your lawn chairs and picnic baskets. 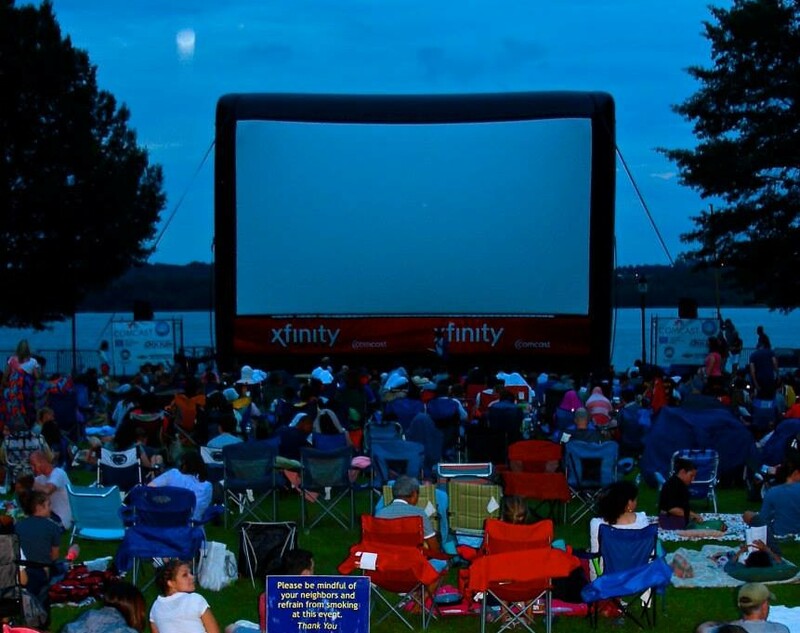 The Alexandria Comcast Outdoor Film Festival takes place in Waterfront Park, 1 Prince St., on July 14 and 15. Take your blankets and beach chairs. This year’s schedule is Moana on July 14 and Rogue One: A Star Wars Story on July 15. Gates open at 5:30 p.m. and the screenings begin at 8:30 p.m. 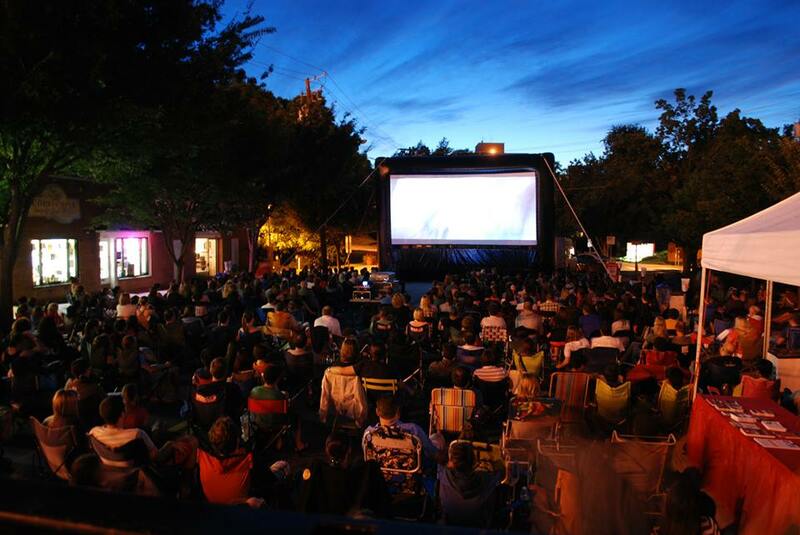 The Four Mile Summer Movie Series show films the last Friday of the month during the summer. 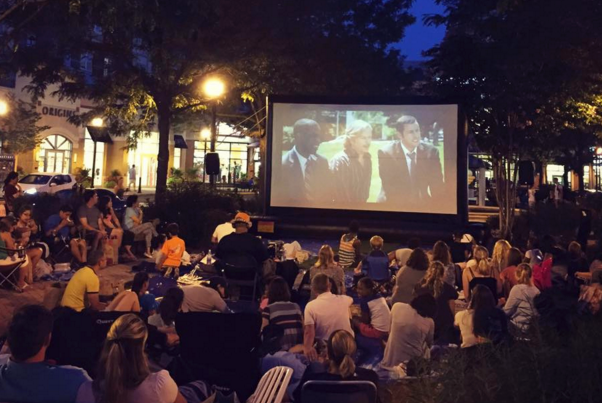 The Four Mile Summer Movie Series is a free, four-week film series in the Arlandria section of Alexandria. 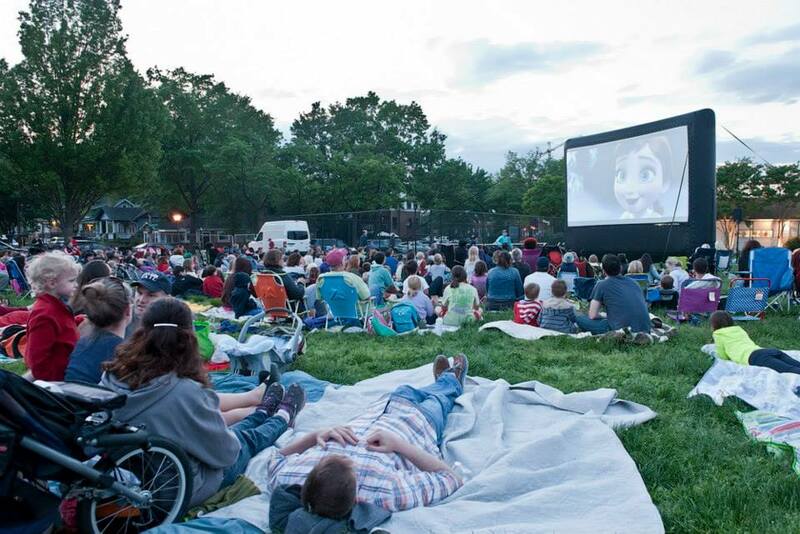 The last Friday of the month from May through August, Restore Alexandria hosts games, giveaways, popcorn, drinks and films under the stars with Spanish subtitles at Four Mile Run Plaza, 4109 Mount Vernon Ave., Alexandria. The movies are shown on an asphalt lot, so take chairs or cushions to sit on. Picnic coolers are allowed. Gates open at 6:30 p.m. with movies starting at sundown. This year’s slate includes The Lego Batman Movie on June 30, The Secret Life of Pets on July 28 and Inside Out on Aug. 25. 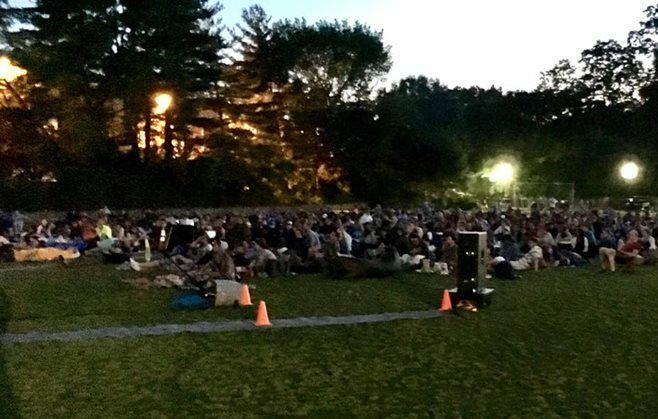 The Bethesda Outdoor Movies take place over five consecutive nights in July. The screenings begin at 9 p.m. at the corner of Norfolk and Auburn Avenues. 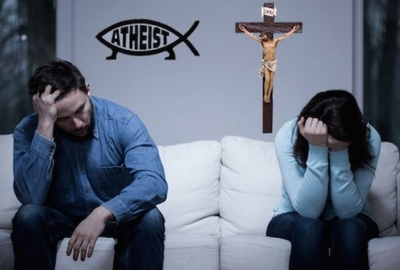 A limited number of chairs will be available, so moviegoers are encouraged to take their own. This year’s slate includes The Wizard of Oz on July 18, Field of Dreams on July 19, Dead Poets Society on July 20, Hidden Figures on July 21 and La La Land on July 22. 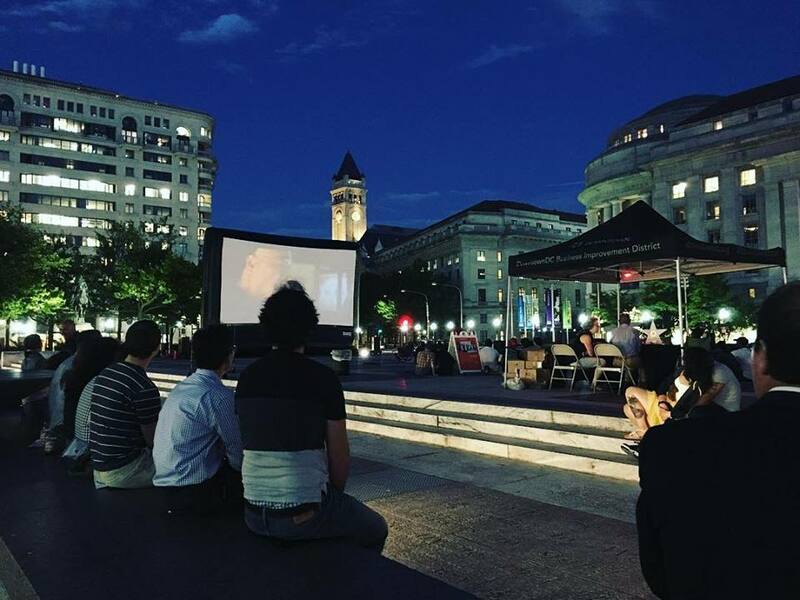 The Library of Congress sponsors free Summer Movies on the Lawn every Thursday from July 13 through Aug. 17 beginning at sunset on the north lawn of the Thomas Jefferson Building, 10 First St. SE between the Jefferson Building and the Supreme Court. 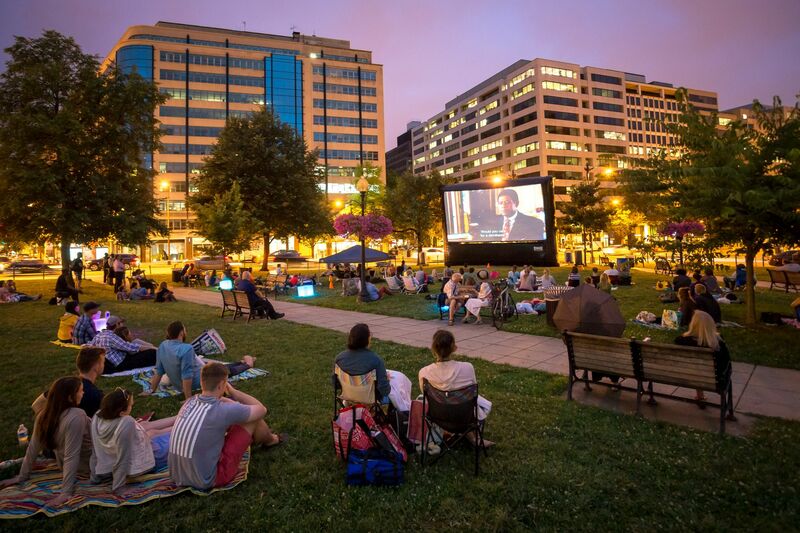 Moviegoers are welcome to take picnics, and food trucks will be parked along East Capitol Street. This year’s screenings, from the National Film registry, include The Princess Bride on July 13, Ferris Bueller’s Day Off on July 20, Raiders of the Lost Arc on July 27, Back to the Future on Aug. 3, Top Gun on Aug. 10 and Ghostbusters on Aug. 17. Another great venue for outdoor films is Capitol Riverfront’s Outdoor Movie Series. 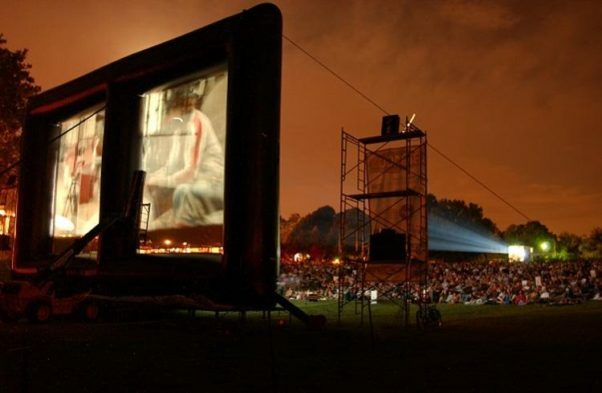 The films are shown at Canal Park, 200 M St. 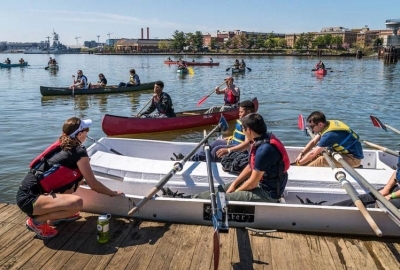 SE, down the street from Nationals Park, beginning at sundown every Thursday. Take a picnic and enjoy the show or visit one of the nearby restaurants. Gates open at 7 p.m. and all movies are captioned. The D.C. office of Asian & Pacific Islander Affairs presents Movie Nights in Chinatown Park with an Asian and Pacific Islander-themed movie line up in the park at the corner of Fifth Street and Massachusetts Avenue NW. 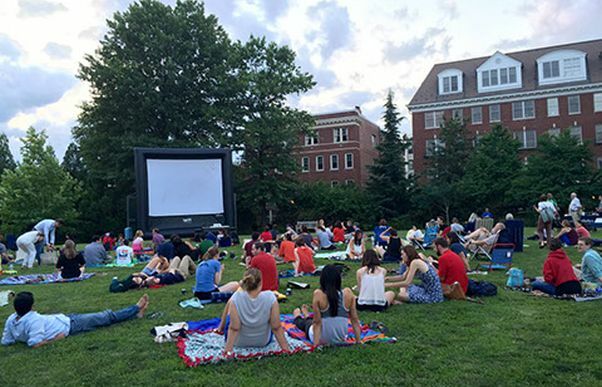 Movies begin at dark – between 8:15 and 8:30 p.m. — with free popcorn and popsicles. Take your own blankets, chairs and bug spray if needed. This year’s schedule includes Miss Granny in Korean with English subtitles on June 14, Moana on July 12, Lion on Aug. 16 and Mulan on Sept. 29. Market Common shopping center, 2800 Clarendon Blvd., Arlington, sponsors dinner and a movie every Thursday in July on The Loop. Take a blanket and picnic and enjoy free face painting and balloon sculpting beginning at 6 p.m. with movies at sundown. This year’s remaining lineup includes The Secret Life of Pets on July 6, Finding Dory on July 13, Sing on July 20 and Back to the Future on July 27. Movies are shown on the Harriet Tubman Elementary School athletic field in Columbia Heights every Friday in June. 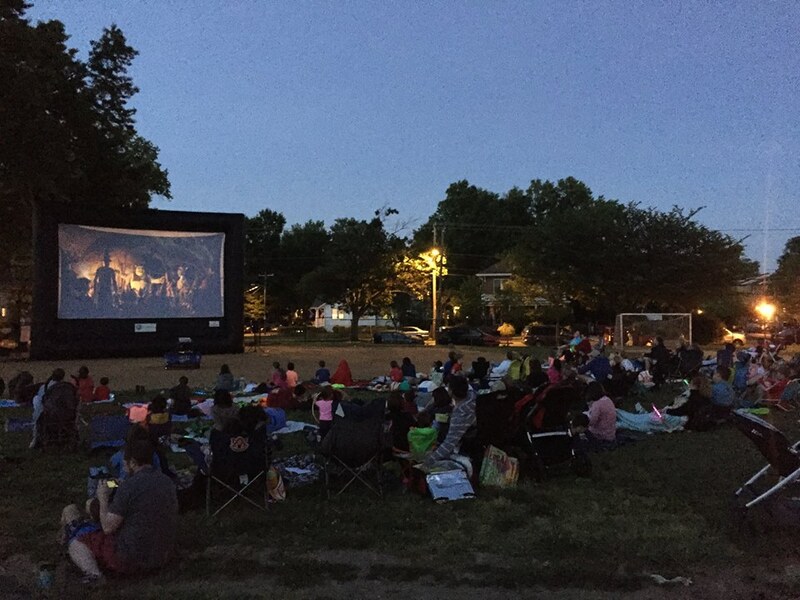 The Columbia Heights Initiative sponsors Movie Nights in the Heights every Friday in June beginning at 9 p.m. Movies are shown on the athletic field at Harriet Tubman Elementary School, Irving and 11th Streets NW. Take a blanket and enjoy a picnic. In case of rains, movies will be shown at the Salvation Army, 3335 Sherman Ave. NW. Remaining screenings include La La Ladn on June 16, Lion on June 23 and Fantastic Beasts and Where to Find Them on June 30. 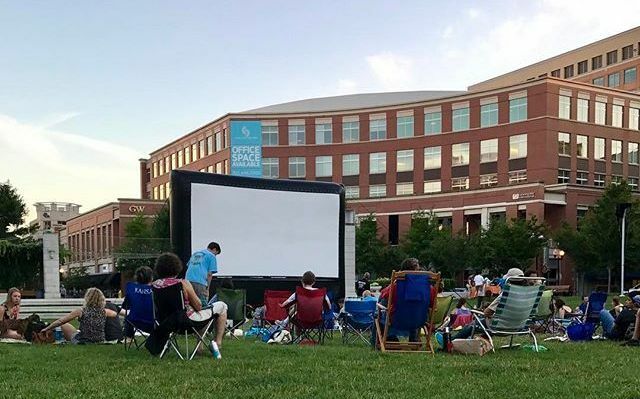 The Columbia Pike Revitalization Organization sponsors movie nights beginning about 8:30 p.m. on Saturdays at Penrose Square, 2503 Columbia Pike, Arlington, and Thursdays at Arlington Mill Community Center, 909 S. Dinwiddie St., Arlington. With the organization celebrating its 30th anniversary, all the movies are from around 1987. The remaining Penrose Square movies include Die Hard on June 17, Moonstruck on June 24, Good Morning, Vietnam on July 1, Dirty Dancing on July 8, Predator on July 15, The Verdict on July 22 and Broadcast News on July 29. Also, Big on Aug. 5, The War of the Roses on Aug. 12, Say Anything on Aug. 19, The Man with One Red Shoe on Aug. 26 and The Princess Bride on Sept. 2. The Arlington Mill schedule features La Bamba on June 22, Spaceballs on June 29, Dirty Dancing on July 6, Raising Arizona on July 13, The Princess Bride on July 20 and Romancing the Stone on July 27. Rounding out the summer series is Big on Aug. 3, Weekend at Bernie’s on Aug. 10, Cocoon on Aug. 17 and Moonstruck on Aug. 24. Congressional Cemetery, 1801 E St. SE, sponsors Cinematery monthly during the summer. 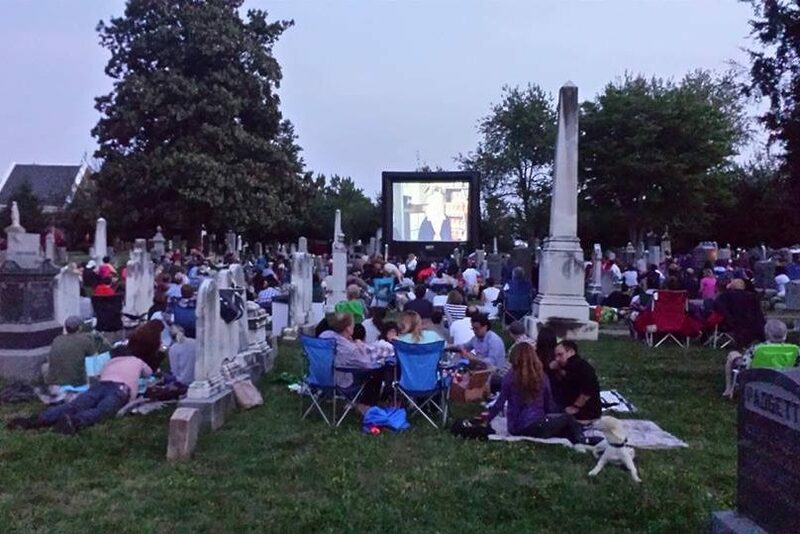 This year’s theme is Film Noir, featuring dark and mysterious whodunits screened among the graves. Movies begin around 8:30 p.m. and are free, although a $10 donation is suggested. Guests are welcome to BYOB and dinner too. Remaining screenings include The Maltese Falcon on July 14 and another, yet-to-be-named movie on Sept. 22. This year’s schedule includes Sing on June 17, Zootopia on July 15, Beauty and the Beast (1991) on Aug. 19 and Moana on Sept. 16. The Dumbarton House, 2715 Q St. NW, sponsors the sixth annual Jane Austen Film Festival from 7:30-10 p.m. every Wednesday in July. Take a blanket or lawn chairs and enjoy the movie in the house’s lush garden. Admission is $6 per film or $20 for all four films. This year’s lineup includes Love and Friendship on July 5, Sense & Sensability on July 12, Emma on July 19 and Pride & Prejudice on July 26. In case of rain, films will be rescheduled for Aug. 2 and 9. 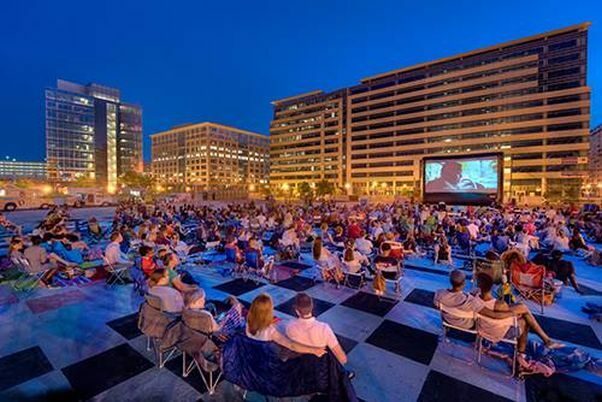 Every Tuesday in June at sunset, the Downtown D.C. Business Improvement District turns Freedom Plaza at 13th Street and Pennsylvania Avenue into an outdoor movie theater with Can I Kick It? featuring a classic or cult martial arts film that is scored with an original music soundtrack of hip hop, soul and more by DJ 2-Tone Jones. Moviegoers can play a game of ping pong on the plaza before the show and munch on free popcorn. The schedule includes The Matrix on June 13, The Last Dragon on June 20 and Big Trouble in Little China on June 27. Georgetown’s third annual Sunset Cinema outdoor movie series returns to Waterfront Park at the intersection of K/Water Street and Cecil Place on Tuesdays from July 11-Aug. 8 beginning at sunset. This year’s theme is Women in Film, featuring iconic movies with strong female leads and story lines from comedies to inspirational dramas. Take your blanket (no chairs please) and a picnic. This year’s movies include Moana on June 16, The Princess Bride on June 23, Dirty Dancing on June 30, Ghostbusters (2016) on July 7, Finding Dory on July 14, Big on July 21, Ferris Buller’s Day Off on July 28 and Fantastic Beasts and Where to Find Them on Aug. 4. Films in the Field is held at Mitchell Park, S and 23rd Streets NW, monthly during the summer. All films are shown on Thursdays, except the last one, which will be shown on a Friday. The schedule includes Raiders of the Lost Ark at 8:40 p.m. on July 13, Ratatouille at 8:15 p.m. on Aug. 10 and The Manchurian Candidate at 7:30 p.m. on Sept. 8. In case of rain, the movies will be shown the same night of the following week. 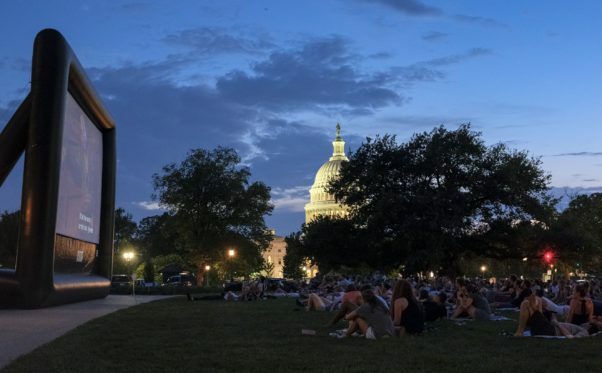 Films at the Stone is the first and only summer film series at a memorial on the National Mall. The films, shown at the Martin Luther King Jr. Memorial, 1964 Independence Ave. SW, “display the best of human love, strength and courage” one Thursday per month during the summer. Screenings begin at 8:15 p.m. and include Fences on June 22, Moana on July 27 and Hidden Figures on Aug. 24. Pack a picnic and take blankets or low lawn chairs. 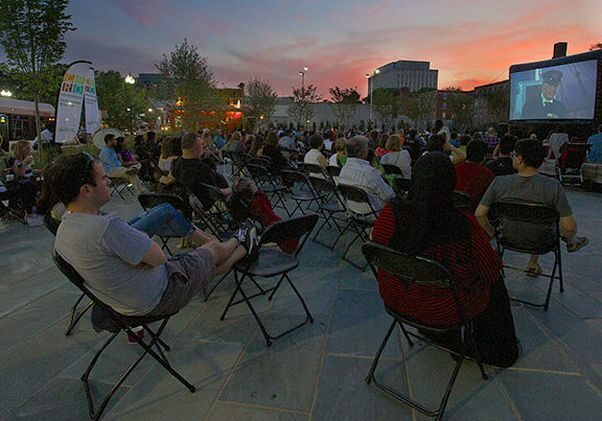 The Mosaic District moved their outdoor movie series from Fridays to Sundays this year from June through August. 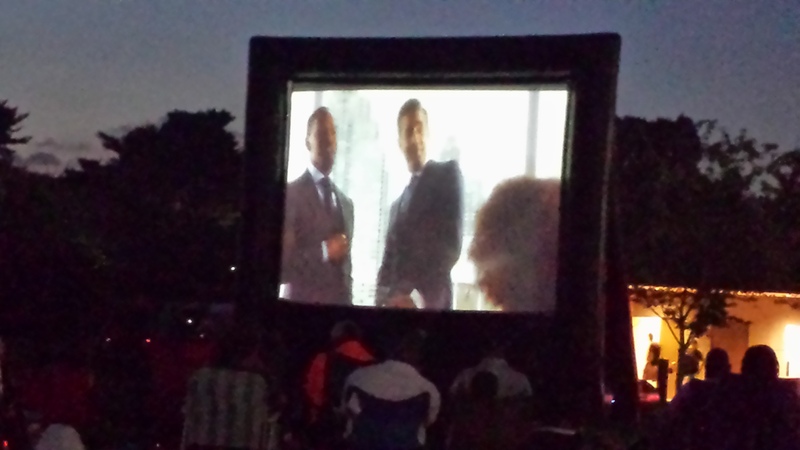 Sunday Night Films in the Park are shown in Strawberry Park, 2805 District Ave., Fairfax. Festivities begin at 6 p.m. with the movie at sundown. 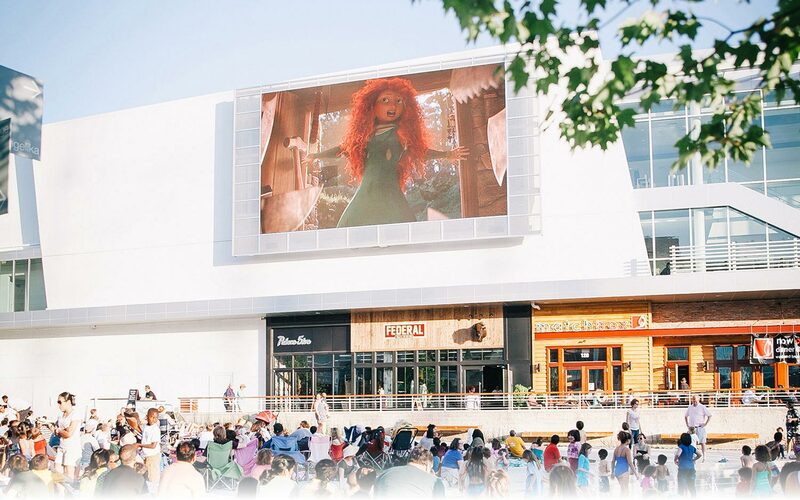 The remaining schedule includes Hook on June 18, The Lorax on June 24, Cloudy with a Chance of Meatballs on July 2,Little Giants on July 9, The Little Mermaid on July 16, UP on July 23 and 101 Dalmations on July 30. August screenings include Tangled on Aug. 6, Snow White on Aug. 13, Mary Poppins on Aug. 20 and The Lego Batman Movie on Aug. 27. 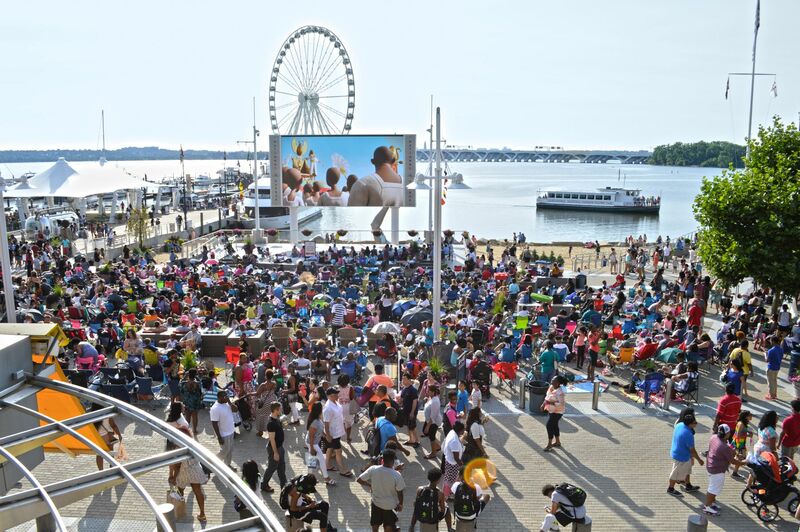 Movies on the Potomac at National Harbor will show family movies on Sundays and date night movies on Thursdays. 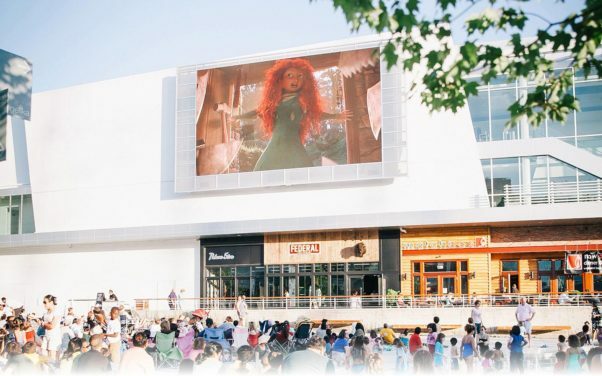 National Harbor shows Movies on the Potomac with family-friendly films at 6 p.m. on Sundays with double features at 4 p.m. and Date Night Movies at 7 p.m. on Thursdays through September on the Plaza’s big screen. Pack your blankets, grab food to go from one of the many restaurants and watch a free movie with a view of the Potomac. Parking is $3 for the first hour, $5 for 1-2 hours and $10 for 2-4 hours. Family movies include Jungle 2 Jungle on June 18, Babe and Sing on June 25, Mary Poppins on July 2, Annie (2014) on July 9, Happy Feet and Frozen on July 16, The BFG on July 23 and Monsters, Inc. on July 30. Also, Space Jam on Aug. 6, The Karate Kid (1984) and The Karate Kid (2010) on Aug. 13, Mighty Ducks on Aug. 20 and Remember the Titans on Aug. 27. The series wraps up with Cinderella (1997) and Cinderella (1950) on Sept. 3, The Little Mermaid on Sept. 10, Mulan on Sept. 17 and Beauty and the Beast (1991) on Sept. 24. Date Night Movies include Sully on June 15, Passengers on June 22, Hitch on June 29, Invictus on July 6, Mean Girls on July 13, Love & Basketball on July 20 and Meet the Parents on July 27. Also, The Blind Side on Aug. 3, Central Intelligence on Aug. 10, Rogue One: A Star Wars Story on Aug. 17, Top Gun on Aug. 24 and a Rocky (1976) on Aug. 31. Ending the series is Foot Loose on Sept. 7, Sleepless in Seattle on Sept. 14, Back to the Future on Sept. 21 and Beauty and the Beast (2017) on Sept. 28. 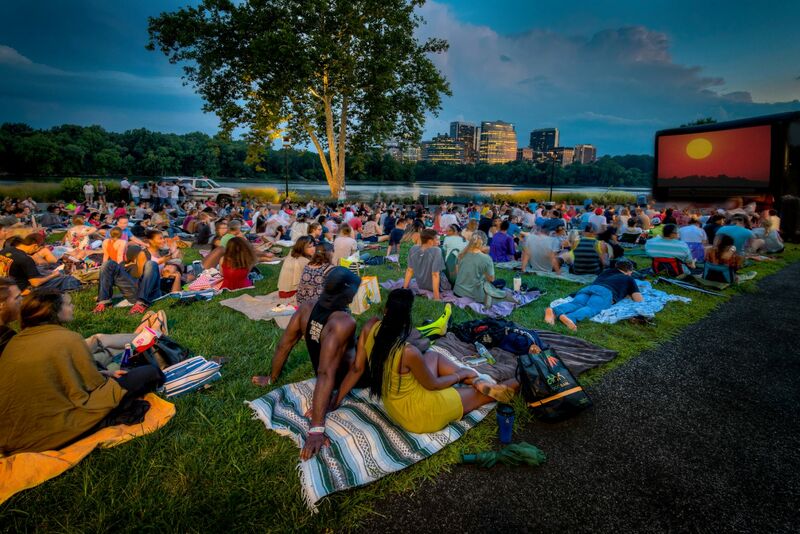 The 21th annual Comcast Xfinity Outdoor Film Festival benefiting NIH Charities brings outdoor movies to Strathmore, 10701 Rockville Pike, North Bethesda, Aug. 24-27. Movies are shown on a nine-story tall, 52-foot wide inflatable screen. 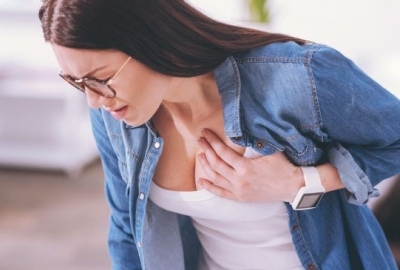 Take your blankets, low-rise chairs and small coolers. Ridgewells will have food for sale. This year’s lineup includes Moana on Aug. 24, Rogue One: A Star Wars Story on Aug. 25 and The Lego Batman Movie on Aug. 26. Films begin at 8:45 p.m. and gates open at 7:30 p.m. with music, visual art displays and games. Classic theater fare, barbecue, wine and beer are available for purchase from Ridgewells. Parking is available at the Metro garage with a credit card or SmartTrip card. The Rosemont Reel has moved this year and is screening outdoor movies at Beach Park, 201 Rucker Place, Alexandria. There’s also free popcorn and drinks. Gates open at 7:30 p.m. and the movie begins at dusk. This year’s movies include King Fu Panda 3 on June 24, Boss Baby on July 9, Trolls on Aug. 12 and Captain Underpants on Sept. 9. 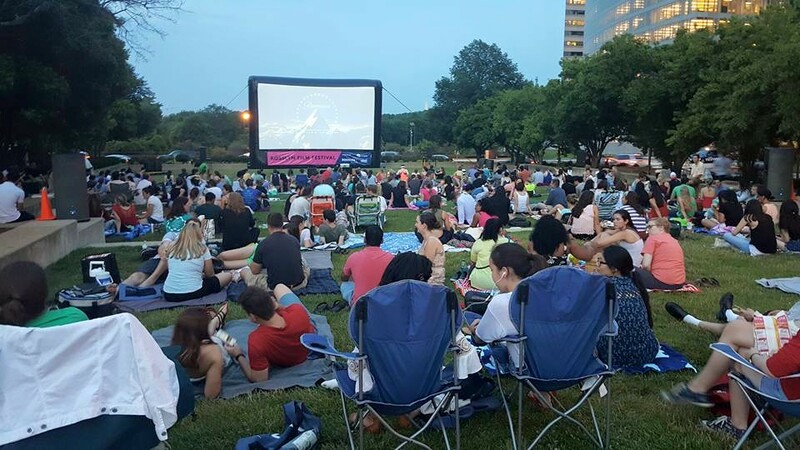 This year’s Rosslyn Cinema + Pub in the Park features games, beer, wine, mocktails and movie-themed cocktails as well as food trucks and an outdoor movie. Shown in Gateway Park, 1300 Lee Highway, screenings start between 8:30-9 p.m. Fridays. Take blankets or low chairs and a picnic or enjoy dinner from the rotating, featured food truck beginning at 5 p.m. Popped Republic food truck will be on hand selling popcorn. There will be a DJ spinning tunes before the movie on June 16, July 7, July 29 and Aug. 18. This year’s lineup includes Anchorman: The Legend of Ron Burgundy on June 16, National Lampoon’s European Vacation on June 23, Some Like It Hot on June 30, Golden Eye on July 7, The Father of the Bride on July 14, Moana with special kids’ night activities on July 21 and The Wizard of Oz on July 28. Winding up the series is When Harry Met Sally on Aug. 4, The Lego Batman Movie with special kids’ activities on Aug. 11, The Avengers on Aug. 18 and Mary Poppins on Aug. 25. 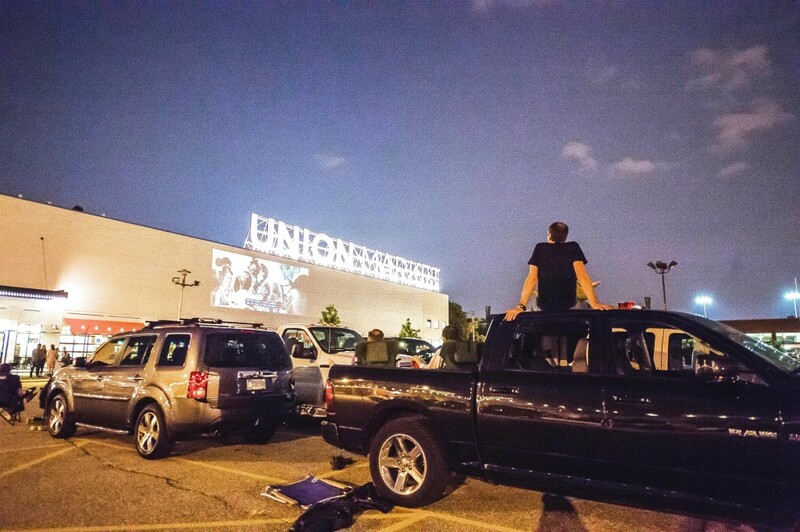 The Union Market Drive-In returns with its biggest season yet the first Friday of the month from April through November. The market, 1309 Fifth St. NE, will show the flicks on the front of the building. The line-up includes Coming to America on July 7, Chef on Aug. 4, Days of Thunder on Sept. 1, Clue on Sept 27 and Willy Wonka and the Chocolate Factory on Nov. 3. The films begin between 6-9 p.m., depending on when the sunsets. Admission is free for bikers and walkers, but parking is $10 per carload.